Taylor’s Academy Series makes the playing experience more accessible in every way, packing signature Taylor playing features into an affordable package. With the A12e, our compact Grand Concert body makes the perfect companion for fingerpicking or anyone with a lighter touch who craves the physical comfort of a small-body guitar. The guitar’s design specs are optimized for playing ease. Taylor’s patented, slim-profile neck features an array of hand-friendly touches: a shorter 24-7/8" scale length, 1-11/16" nut width, low action, and light gauge strings, all of which contribute to a slinky handfeel. 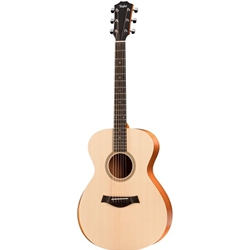 The lightweight guitar body, featuring layered sapele back and sides with a solid Sitka spruce top, boasts an ergonomic armrest that enhances the playing comfort for one’s picking arm. The guitar was also voiced to be extra responsive to make the playing experience as relaxed as possible. The guitar comes with an onboard ES-B pickup that includes a built-in digital chromatic tuner, and comes with a sturdy lightweight gig bag.